A couple months back, I was talking with a friend about the kind of recipes that blow people’s socks off, but are actually super-easy to make. We both agreed that many candy recipes fall in this category; some candy takes artisan-level skill and effort, of course, but others — fudges, for example, and many caramels and candied fruits — can be thrown together pretty easily. And then there’s candied peanuts, which I’ve adored since David Lebovitz wrote them up in a blog post six years ago. Lebovitz’s recipe is wonderful just as it is, but since the holiday season was approaching, I thought “well, let’s gild that lily!” When winter rolls around I always want citrus flavors, since so much is coming ripe in December–February, so I knew I wanted to incorporate something there, and around Christmastime I always start to show my Scandinavian roots by wanting to put cardamom in everything: orange-cardamom would be the flavor. “I should be able to bang that out this weekend,” I thought. 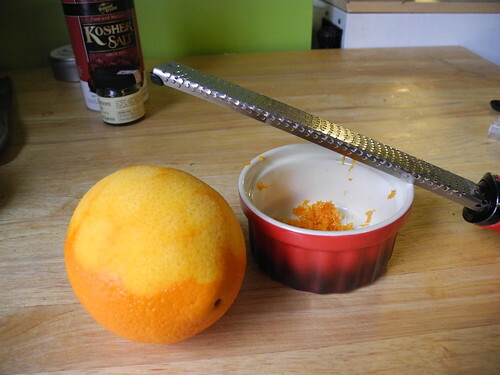 I don’t care how much dried orange peel you have lying around, or how obvious that solution seems: it’s a non-starter. Cardamom is a very strong flavor, but caramel and toasted nuts are really strong, too, and undue caution leads to magically-undetectable cardamom. Subbing in orange juice for water not only gives you a slightly odd cooked orange flavor, but also may transform this recipe into the thinnest, saddest brittle recipe ever created. Raw peanuts with skins or without skins? This was my only initial worry, and it turns out to make no difference whatsoever. Go figure. But my frustration is your gain, because I’ve got it now, and it should have been obvious from the start: freshly grated orange zest, combined with pungent cardamom, just enough to give a spicy undertone (I ground mine fresh, because I’m a spice nerd, but pre-ground cardamom should be just fine as long as it hasn’t been sitting in the spice cabinet since that theme party you threw for the Lillehammer Olympics). So whether you’re looking for an unexpected snack for holiday guests, a thoughtful appreciation for the host of a party, or a last-minutes desperation gift for that one person you can never shop for: here you go. 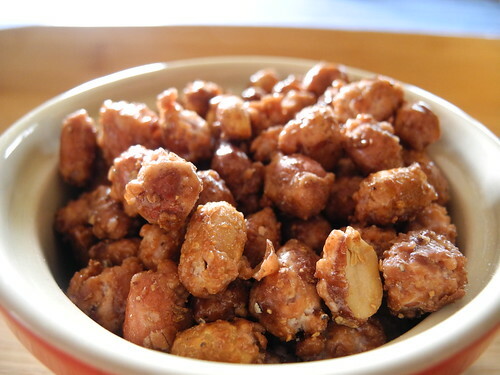 You really can’t go wrong with these simple, delicious nuts. In a wide, deep skillet, combine the peanuts, sugar and water. Cook over moderate heat, stirring frequently. You will feel the syrup getting thicker as the water evaporates (see this image), and suddenly the mixture will seize up and become dry and sandy (see here) — this is perfectly normal. 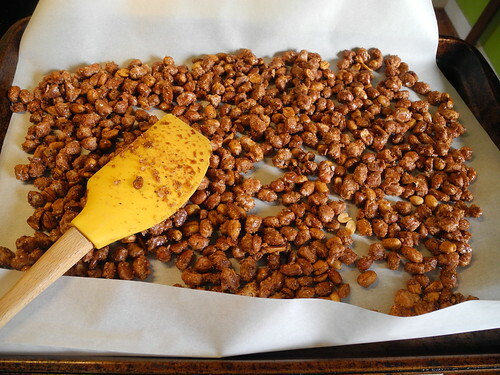 Continue stirring, moving the dry peanuts and sugar toward the hot spots in your pan where a liquid caramel is forming. As you continue stirring, the caramel will coat the peanuts. Keep cooking until the peanuts are a dark, rich brown. They will smell toasty, which is normal, but if you notice any smoking, remove the pan from heat briefly, and turn down the burner slightly. When the peanuts are deeply browned, remove from heat and immediately sprinkle the cardamom, salt, and orange zest over the mixture. 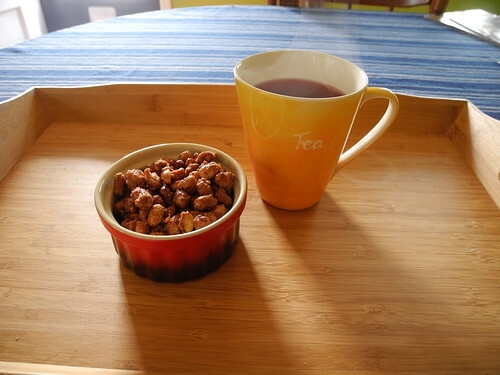 Stir to combine and pour peanuts onto a baking sheet lined with parchment. When peanuts are completely cool, break them up and store in an airtight container. They will likely last for two weeks, maybe more; they’ve never stayed around long enough to find out! These are easy and fun, but if you’re not a candymaker you might not realize the temperatures you’re dealing with. The caramel is very hot, well in excess of 300 degrees Fahrenheit, and it’s sticky — if a peanut escapes, resist the urge to grab it and toss it back in the pan, at least until it’s cooled for a moment. Allergic to peanuts, or just don’t like them? Almonds would be a very easy substitute here. Other nuts would work as well, but you’ll likely get more crunchy, uncaramelized sugar lodged in the cracks of walnuts, pecans, etc. Still delicious, but a different result. Whatever nut you use, just make sure it’s raw; it will undergo significant cooking during the candying process. You can also adapt the spicing in pretty much any direction. Lebovitz recommends they either be plain or with a sprinkle of chili powder, and both of those sound lovely. As I was writing up this post my husband joked about cilantro peanuts, but honestly that sounds like it could be amazing, maybe with some grapefruit zest. See what I mean about pretty much any direction? Found your blog thru Smitten Kitchen! Your orange cardamom nuts look lovely and will try them this weekend. I noticed your pic shows the Penzey’s cardamom as whole, not ground. Did you grind your own spice? Is it worth it for the peanuts? Welcome! And thanks, I do love this recipe and hope you will too. I tend to keep whole cardamom around, just… because? 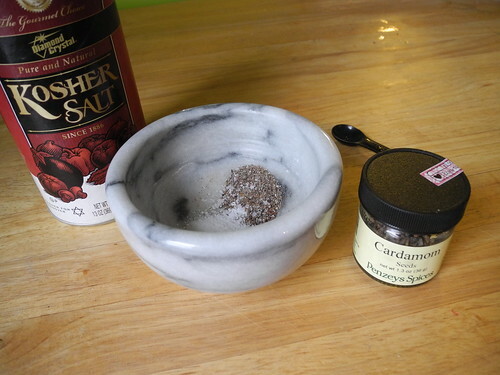 (I have a weird joy in grinding cardamom in a mortar and pestle.) But there’s absolutely no need to buy whole cardamom for this — the recipe needs ground spice anyway.